Last month in Europe I got asked the same question I get asked in the States: How do I animate and effervesce my wooden, flat speaker? 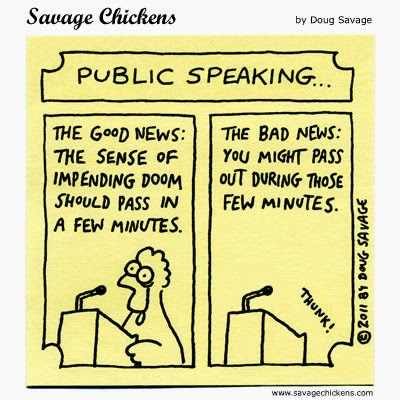 Bring in a speaking coach, is the easy answer. Too easy, in many cases. Coaches can polish a rough speaker, but teaching a stiff speaker to act animated is like tying ropes to the arms and legs of a corpse. Speakers are stiff because they are scared. And they are scared because they should be scared. For they have permanently stolen an hour from the lives of many human souls, and they know full well they don’t have anything to say that is of real importance even to themselves, let alone to this innocent crowd. And so the fourth-grader stood, shame-faced but brave, in front of classmates with whom he or she had exchanged fart jokes that very morning and pretended to be an authority on the benefits and drawbacks of cloning (while the classmates, with mixed success, pretended to care). And said the expected things for the required amount of time and sat down and hoped that the next such assignment would be proceeded by death. 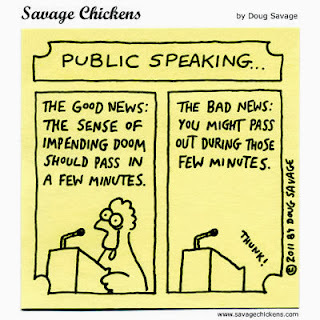 And that’s pretty much exactly how public speaking went down for the fourth-grader, as he or she passed through junior high, high school, and college, where the phony passion was applied to mouthing rote arguments for or against euthanasia, raising the drinking age, and the legalization of drugs, exactly in that order. Then a merciful decade or two passed—during the fourth-grader’s early work life, when most of the speeches were being given by the elders—and the fourth-grader’s oratorical participation consisted mostly of pretending to be interested in other speakers who were pretending to be interesting. But then one day the fourth-grader became a manager. And soon an executive. And then a senior executive. And finally the call came: Would the fourth-grader honor a faceless audience by appearing at a random leadership forum and delivering a speech on an unspecified topic? That’s when the fourth-grader became your client. And you wonder why your client is elusive and would appear to prefer to focus on any aspect of her work rather than the speech that’s coming up. Don’t be surprised! Your client is a fourth-grader! And do you know who you are? In the fourth-grader’s mind, you are the teacher who is trying to get the fourth-grader to choose one of the five weary topics that you have suggested! Long before the fourth-grader understood his or her own mind well enough to have anything genuine to say that could be sustained over more than a single minute of oratory, he or she had utterly disassociated public speaking from true candor and intimate communication. So if you are to recouple these two concepts in your fourth-grader’s fully grown (and thus half-ossified) mind, you will have a hell of a job ahead of you. You have to ascertain something true and deep about what motivated the speaker to climb all the way from the fourth grade to the position of CEO of your company. Are we dealing here with a brilliant or dogged engineer? A passionate financial analyst? A natural motivator of people? An idealistic believer in the industry? Or just a gasoline-driven ambitious maniac? Whatever the qualities that got the fourth-grader all the way to this exalted position (far ahead of all of the fourth-grader’s classmates)—well, you’ve got to understand something about where those qualities came from, and how they connect today with the fourth-grader who’s still inside. And now you’re threatening to write a speech that’s outside of the five suggested topics. A speech that feels like something only your fourth-grader could give—because it’s about his grandpa, it’s about what she did over the summer, it’s about why he doesn’t like to get a haircut, or why she thinks it’s better to be a tomboy than a girly-girl. And suddenly, the fourth-grader isn’t so focused on the PowerPoint deck. Suddenly the fourth-grader is up for trying it without a lectern. Suddenly the fourth-grader is laughing on stage, and wondering aloud whether you should maybe be videotaping this speech, to send to all the employees. Because she suddenly realizes: Shc can’t remember giving a speech that sounds so much like herself. Could she have a straight-up conversation with him about beginning to choose the topics he speaks on based on the issues he feels most personally connected to? So that, to whatever extent strategically advisable, every speech he gives is about his beloved old car—or his mother, or his freshman history professor, or his political mentor, or an intellectual revelation or a personal turning point or anything that’s as as true to the fourth-grader as it is to the man? Yes, she said. She actually thought she could have that conversation. I told her to keep me posted. She looked at me skeptically but could see that I meant it. The speeches they generate together will all be in Danish. But if she succeeds, the communication they achieve will speak to us all. I’ll keep you posted on her work with her fourth-grader, if you keep me posted on your work with yours. David Murray is the editor of premier online speechwriting magazine Vital Speeches of the Day. This article was first published on VSOTD here. Guest post: End Procrastination Now!